The automotive battery is a rechargeable battery that supplies the electric power to a vehicle e.g. cars, vans, trucks or buses. It is also sometimes called the SLI Battery which stands for Starting, Lighting and Ignition. One of the main purpose of this battery is to start the engine. Once the engine of the vehicles have been started, the power for the vehicle is supplied by the alternator. The Alternator will also charge the automotive battery when the engine is running. 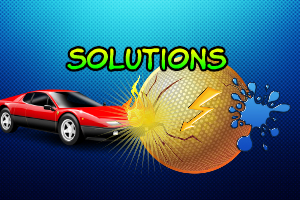 The automotive batteries are normally designed to supply a high burst of current which is required to start the engine. Most of the current automotive batteries used in our conventional vehicles are using the Lead Acid Battery. One of the main reason for using the Lead Acid Battery as the Automotive Battery is because of the cost. Lead Acid Battery is currently one of the most common and cheapest batteries available. 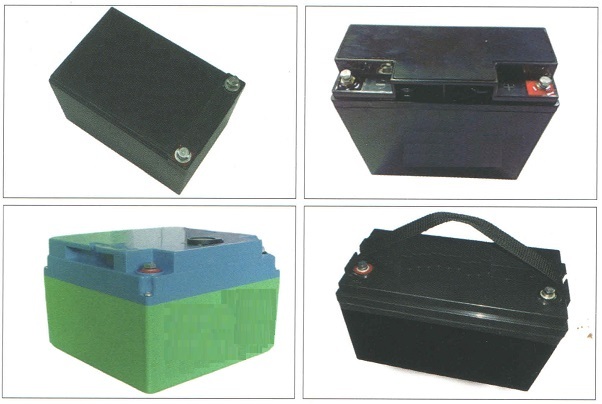 The drawback of using the Lead Acid Battery is of course, the short Lifecycle of the Lead Acid Battery. A typical Lead Acid battery that is used as the Automotive battery can last about 1 to 3 years depending on the quality of the battery. The LiFePO4 Automotive battery is another good alternative to the Automotive battery. Even though the price may be more expensive, the longer lifecycle can easily justify for the higher initial investment. Since the LiFePO4 Automotive battery have a lifecycle of >2,000 cycles, it can easily last more than 8 years which will provide a peace of mind to the vehicle owners. Nanocarbon Batteries provide lightweight, high energy density power sources for a wide variety of devices. 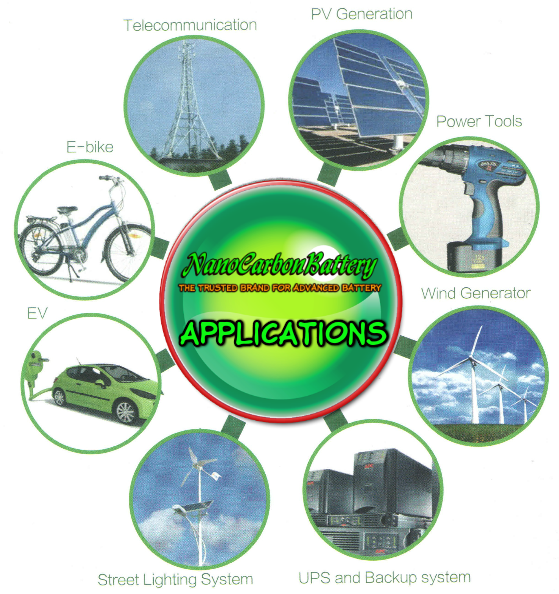 With these features the nanocarbon battery applications can be wide ranging. It can also be used to power larger devices such as electric cars, electric motorbikes, boats, carts, telecommunication network towers, micro grid, UPS and many others. To power larger devices such as electric cars, the nanocarbon batter cells need to be configured in parallel circuits to provide the required current and power. It can also be used in portable devices such as the mobile phones, smart phones, laptops, tablets, digital cameras, camcorders, power tools (such as cordless drills, sanders and saws), radio-controlled drones, floor cleaning machines, powerbanks etc. Imagine a battery that can be charged super fast and perform unaided at -20 deg Celsius. Imagine its lifecycle of 2,400 and a safe battery that eliminates the concern of overcharging and overheating(unlike the Lithium batteries). 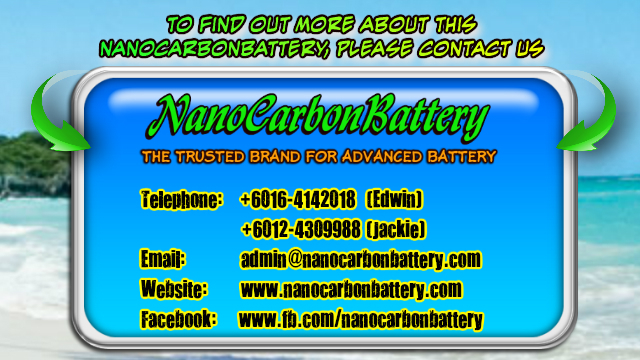 The NanoCarbon Battery is indeed the New power solutions for everyday applications!!! We live in a very paradoxical world. While the key driver to convert from a conventional gas guzzling vehicle to a supposedly more environmentally friendly electric vehicle is applauded, much cannot be said in the development of the batteries that are currently being used in these electric vehicles. The Nanocarbon battery solutions can hopefully address some of these problems while maintaining the environmentally friendly production of the batteries. The process of producing conventional batteries is often toxic and non eco-friendly. In addition to that, traditional Lithium Ion batteries have a high tendency of heating up during the charging and discharging cycle and in certain cases may explosively combust. Any type of puncture or crushing to the outer layer of the battery may potentially result in a thermal runaway which may lead to catastrophic consequences. Safety is one of the most important criterion for an electric vehicle battery. Even a single battery fire could turn public opinion against electric mobility and set the industry development by months or years backwards. The main concern here is the issue of thermal runaway – a positive feedback loop whereby chemical reactions triggered in the cell exacerbate heat release, potentially resulting in a fire. Thermal runaway can be caused by an overcharged battery, too high discharge rates or even a short circuit on the battery. Solution: Nanocarbon battery’s makeup consists of vegetable fluids electrolytes which does not generate toxic gases and combustible components even while it is being over-charged or over-discharged. Its low internal resistance also makes the rise in temperature during its charging and discharging to be negligible. This safety concern alone should make the nanocarbon battery, the battery of choice to be used for electric vehicles. In addition to that, the nanocarbon battery can still be functional even if it is submerged under water. Lifespan of battery is another key consideration for many applications. There are 2 ways to measure the lifespan of a battery, that is, cycle stability and overall age of the battery. Cycle stability refers to the number of times the battery can be fully charged and discharged before being degraded to 80% of its original capacity at full charge. This is also known as the time taken to reach 80% depth of discharge for the battery. Some batteries like the NiMH and the NiCd batteries may need to be conditioned in order for it to last long as they have what we call the memory effects. The overall age of the battery on the other hand refers to the duration of the useful life of the battery. Both the cycle stability and overall age of the battery will contribute to the overall lifespan of the battery. Solution: Nanocarbon batteries do not have memory effects and hence do not need to be conditioned. In addition to that, it also has a long depth of discharge time and its cycle time is typically about 2,400 times or higher. Battery Performance is another key problem that many batteries have failed to live up to expectations. 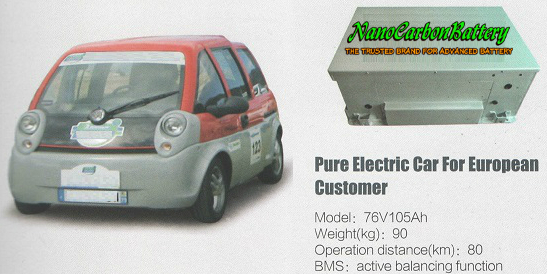 This is especially so for electric vehicles which are operated in an outdoor environment. It is expected to work at both blisteringly hot summer temperatures as well as at sub-zero winter temperatures. Some batteries cannot work under cold temperature condition while some others may not be able to be charged or discharged at high temperatures. Using these batteries may result in putting some restrictions onto the vehicles where it may be operated or if some of them can be allowed to be operated inter-region. Solution: Nanocarbon batteries are inherently safe and have a large range of both charging and discharging temperatures. It can be discharged or operated within a temperature range of -20 deg Celsius to 60 deg Celsius. It can also be safely charged at a temperature between 0 deg Celsius to 45 deg Celsius. 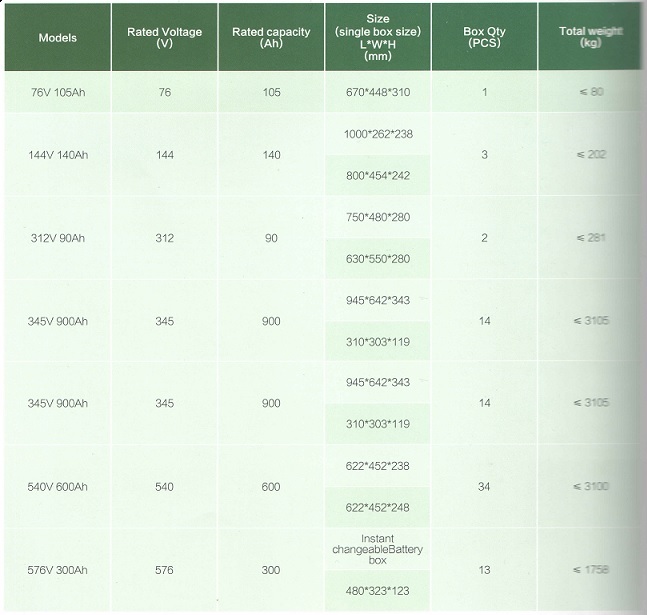 Battery Capacity is another important component for battery selection. The battery capacity is often related back to the energy density of the battery. A higher capacity battery will be able able to pack in more energy within a smaller casing. For an electric vehicle, this is important as it will be able to pack in a longer range to be covered by the electric vehicle. A battery with low energy density also makes it impossible to be fitted into an electric vehicle as the size and weight of the battery will make the electric vehicle to look bulky and inefficient in its operations. Solution: Nanocarbon batteries have an energy density of 123Wh/kg or higher which makes it possible to pack a high capacity battery within a reasonable size casing. Charging Time is also important in the selection of battery as this could mean long idling or down time for the machinery/vehicle while they are being charged. Typical charging time for most batteries to achieve a full charge are between 4 to 8 hours’ time. The opportunity costs lost while waiting for the charging to complete is in fact a very significant drain on resources and something which need to be taken into consideration when selecting the right battery for the application. Solution: Nanocarbon batteries can be paired with the right charger to achieve a full charge in 1 hour(using a 1C rated battery) or in only 12 minutes(using a 5C rated battery). Savings in the charging time will therefore translate into higher Productivity which is another important economic consideration when choosing the right battery. Costing$ of the battery is the last but definitely not the least consideration in selecting the right battery for the applications. Thanks to the experience and scale of the operations towards higher volume manufacturing, the cost of the battery has been has been gradually coming down over time. Still, it is not coming down at a pace that is fast enough. This is also one of the reason why the electric vehicle industry is not growing at the pace that it should. The cost of the battery alone is currently close to about half the cost of the entire electric car. In order for the electric vehicles to drop further in price to be competitive with the conventional gasoline counterpart, the price of the battery needs to be further reduced. Solution: The current price of the nanocarbon battery is within the same range as that of the Lithium Ion batteries. With higher adoption of the nanocarbon batteries and with scale of operations, hopefully this cost can and will be reduced over time making it more feasible for an electric vehicle using the nanocarbon battery to be priced more competitively compared to the conventional gas guzzling vehicles. Conclusion: The NanoCarbon Battery Solutions does indeed solve a lot of problems. The consideration for the right battery on the various applications hinges on many different factors. While there will never be a situation where one battery fits all kind of situations or applications, the battery market is indeed big enough for all battery manufacturers out there. Given that the nanocarbon battery could satisfy most of the criteria above exceedingly well, it should be given some serious thoughts and considerations in most applications that will require the use of reliable and high quality batteries. 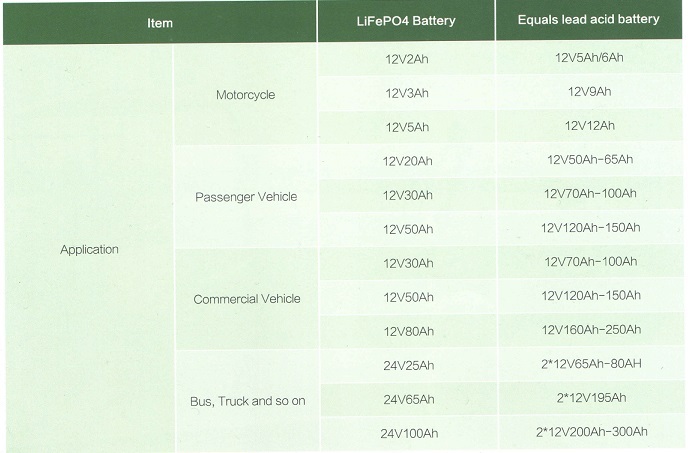 Our LiFePO4 Battery Products are secondary or rechargeable batteries. Studies have shown that the most potentially harmful cathode material in a typical battery is Cobalt and Nickel. These materials can cause negative respiratory, pulmonary and neurological effects to those exposed. This battery does not have Cobalt and uses less than 2% in total composition of Nickel. Hence, this battery is Eco-friendly and non-harzardous. Safety – Our LiFePO4 battery eliminates the concern of overcharging and overheating which is inherent in most batteries. The internal resistance of the battery is small and the change in temperature of the battery during the charge and discharge cycle is negligible. This can eliminate the situation called the thermal runway where an increase in temperature changes a condition in a way that causes a further increase in temperature which often leads to a destructive result, that is fire and explosion. The LiFePO4 battery is safe and can function even if it is being punctured. 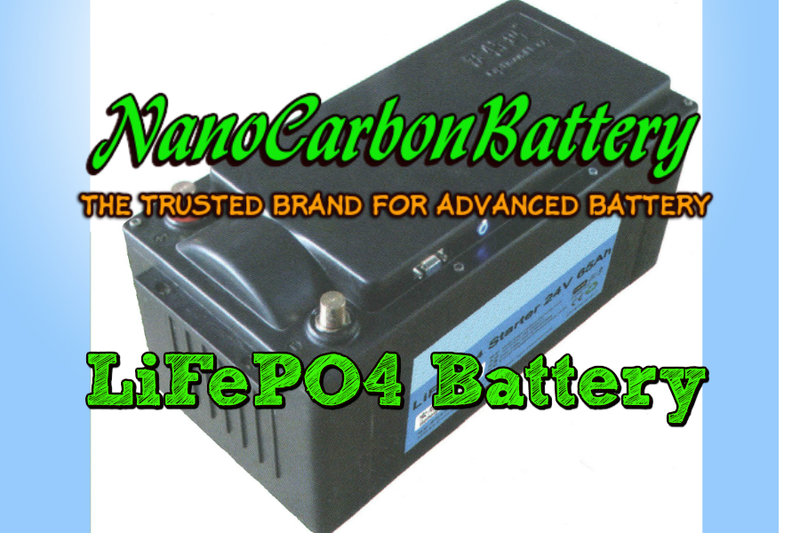 This makes the nanocarbon LiFePO4 battery a very safe option to be used in most applications. Short Charging Time – Our LiFePO4 battery can be configured and paired with the right charger to achieve fast charging. The charging time for our nanocarbon battery ranges from 1 hour(for a 1C rated battery) to 20 minutes(for a 3C rated battery). With fast charging time, there will be more productive use of the equipment/vehicles/appliances. Long Life Cycle – The LiFePO4 battery has long life expectancy. A typical nanocarbon LiFePO4 battery can have a lifecycle of up to 2,000 cycles(80% DOD at 1C). In addition to that, it also has a very low self-discharge rate. The self-discharge rate per month is less than 3% compared to ~10% for Lead Acid Battery and about 13% to 15% for Ni-Cd Battery. High Energy Density – The LiFePO4 cell is a non-aqueous system having 3.2V as its nominal voltage during discharge. It has a specific capacity of 120Wh/kg. With its high energy density, our clients will have the options of reducing the form factor of the casing or to pack more capacity within the same original size casing. Good Value for Money Cost Performance – The Nanocarbon LiFePO4 Battery is more powerful than the Lead Acid Battery and could last much longer. At a working temperature of 60 deg Celcius, the battery could last between 5 to 10 years. With zero/minimal maintenance cost during the life cycle of the battery, it will indeed be a value for money option for those who seeks Cost Performance for a safe and reliable battery solution.